Every single day our locally-based, caring mCareWatch team speaks to our customers, answering queries, guiding them through our products and services and, sometimes, helping them in times of stress and emergency. That gives us real insights into the challenges our customers face, and the kinds of services and solutions they need. These case studies and testimonials tell their stories. Even at 72, when Kerry’s mum Jacqueline walks, she sets a cracking pace. And she loves walking. This is has stood her general health in great stead, but it’s also become a bit problematic since she was diagnosed with dementia about five years ago. “Mum would take herself off for a walk then get confused and turned around. A few times we even had the police out looking for her. When they’d find her, she wouldn’t realise exactly how lost she was or where the time had gone,” recalls Kerry. A much loved member of her local community and with a social spirit undiminished by her illness, when Jacqueline went wandering her family was alerted by her neighbours and friends. She was always brought safely home. However both Kerry and her dad, Bill, Jacqueline’s main carer, feared it was only a matter of time before she slipped away unnoticed and the outcome would not be so good. The search for a way to keep track of Jacqueline and ensure she could communicate with her family anytime and anywhere was on. The watch immediately became Jacqueline’s must-have accessory and she’s been wearing it ever since. Since the initial diagnosis, Bill, Jacqueline and Kerry have worked with carers to create a weekly routine that gives Jacqueline the safety and stimulation she needs, especially as her symptoms have become more pronounced. It includes a blend of carer visits and day care to enable Bill – who is in his eighties – to continue his golfing and other hobbies, and leave Kerry able to go to work with confidence and take care of her own household as well as spending time with her mum. “These days she’s not left alone at all, she cannot be by herself, but she still wears the watch,” says Kerry. Even with changing health and circumstances, the watch remains a strong support. In fact only recently Kerry used the GPS tracker watch to find her mum when they were out shopping and Jacqueline surged off to a different section of the department store. Kerry’s caring tip: take it day by day and make sure every day you learn something to make it better for next time. Being flexible and open enough to adapt to new situations rather than sticking to past habits is very helpful. Don’t rock the boat unless you have to, focus on what causes distress and find ways to avoid or get around those situations, whether it’s having an afternoon nap to bypass “sundowner” syndrome, turning off the grisly and disturbing nightly news or steering clear of crowded, noisy places. If night time wandering is a problem, try playing a talking book for soothing distraction. Guido has always loved a drive. The freedom his car has given him, especially since living alone after the death of his wife, has been a vital part of his life. 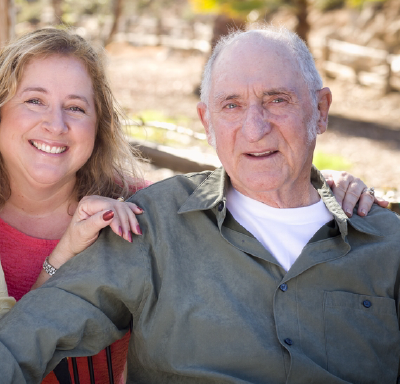 Retaining his driver’s license by passing regular tests as he’s aged into his eighties, has been a must for him and a need his family understood and supported. Unfortunately, a few years ago Guido began getting lost while driving. His confusion and disorientation saw several “emergency situations”, with Guido, who is now 85, lost and distressed and his family unable to locate him. Both the all-important independence Guido’s driving gave him – and the support of his family – was thrown into question. Anthony, Guido’s son-in-law and the self-confessed “techno geek” of the family, was the natural choice to find assistive technology to keep track of his elderly father-in-law. As he explains, both Guido and his family needed the safety and peace of mind of more advanced personal GPS tracking and communication. A straight mobile phone was not the answer because Guido would not remember to carry it with him. The initial solution was to put a GPS tracker into Guido’s car – but this did not entirely solve the problem as it provided no automatic notifications. The family had to realise there was a problem before knowing when or if Guido had left home, so they could be on alert for his return. Nor did this device give Guido the option of making emergency contact with his family, and vice versa. “I began looking online for a “GPS tracker watch” technology and could only find devices for tracking your own fitness – nothing that addressed our concerns. The mCareWatch was referred by a sergeant at the NSW Police Force who had spent a lot of time working in crime prevention and the elderly. The technology they offer was very appealing because it fills so many gaps, offering a lot of features in one,” explained Anthony. Guido’s family has opted to set his GPS tracker watch up so it alerts them when he leaves a certain area (known as geo-fencing). They can track his location via their Smartphones when they’re worried about him. Also, because the GPS tracker watch is a mobile phone and personal emergency alarm, they can all contact Guido at will and, by pressing the red SOS button on the watch, Guido can automatically contact the family. Guido does not have to remember anyone’s phone number – just press the red SOS button. As well as sending low battery and geo-fencing notifications to family and carers, the GPS tracker watch can receive medication and appointment reminders that both Guido and his carers – who come in most mornings to help him with his daily routine – find useful. In fact, the watch recently helped the family avoid an emergency when Guido spent a couple of weeks in a respite care centre. Anthony set up a geo-fence around the facility, so when Guido wandered out without staff knowing, the emergency alarm watch immediately sent alerts to family members, who called the centre and gave staff his location. “He’d been gone a good half hour and they had not even registered he’d left the premises,” said Anthony. Anthony’s family and carer tip: To support your loved one’s health and safety, set up a strong routine that covers all the necessities every single day and try to make it a habit. Setting up a regular daily routine for meals, medication and personal care offers reassurance for both loved ones and carers and a strong positive focus around which to build the day. Jenny Owen describes the day her son, Dylan Owen-Buoy went missing as the worst of her life. 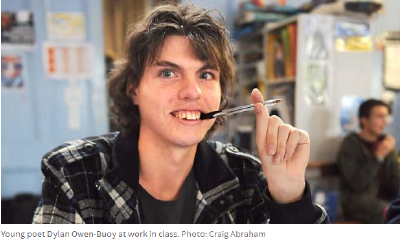 Dylan is 24, has autism, uncontrolled epilepsy and an intellectual disability. He had left his day care program to find fish and chips for lunch and got lost. He should not have been allowed to leave the centre, but mistakes do happen and this was one of them. Hours had passed. The police were called. The local community mobilised and scoured the streets. As the police chopper flew overhead, just one of Jenny’s many fears was that he was overdue for his epilepsy medication and could have a seizure anytime, anywhere – without any of his trusted carers to support him. But there was no way to track him and little chance that Dylan, terrified and disoriented in unfamiliar surroundings, would be able to phone for help. Thankfully, Dylan was found safe and well by some friendly construction workers on a building site he’d wandered onto. The relief for all concerned was enormous. This incident occurred in a time Jenny now refers to as “before the mCareWatch”. It was after Jenny saw a demonstration of the watch, which works as a mobile phone, personal GPS tracker and personal emergency alarm (among many other features) on television that she and Dylan entered what she calls “after the mCareWatch”. “I have a background in disability care as well as my own personal experience with Dylan so when I saw this watch on tv when they were talking about using it for aged care and the elderly I thought this could translate perfectly for people with disabilities. It’s so discreet but it’s an all-in-one solution to so many problems,” Jenny explains. 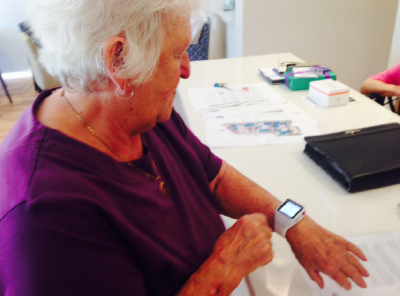 Jenny explained the watch’s features to some of Dylan’s support workers, who thought it was a great idea. As Jenny went on to explain, she has actively shared her experience with the GPS tracker and emergency alarm watch with those she believes will benefit. Following that incident, Jenny wrote to Police Search and Rescue, Autism Victoria and the Epilepsy Foundation to let them know about what she calls a “common sense” solution to so many shared problems. The icing on the cake with Jenny and Dylan’s mCareWatch experience has been the personal touch with customer support. Jenny’s caring support tips: the human touch is everything, so persist with finding and building both formal and informal support networks. And focus on the positive. Being able to share tips and experiences with empathetic groups and individuals can be the best way to find tips and information that can make everyday life so much better and save you so much time and effort compared to just searching for it alone. Find out more about Dylan, his talent for poetry and how his determination to achieve greatness unbowed by his disability has made him a role model for all Australians. “After a couple of years now wandering the world, I have had to bring my dad home to oz, and he is now residing up in a secure dementia unit. So it is time to end this service please. Thank you Mcare for the service. It has helped us a lot. I even paid dad a surprise visit in Cambodia last year to check how things were getting on. And with his Mcare watch it was easy to track him down riverside at dawn one day in Phnom Penh! And the other time it was of great use was 2 years ago when I was sending him to/from Cambodia on his own (assisted passage) but was able to track him and talk to him while transiting in Bangkok airport.